Second-seeded Mira Costa (20-9) edged No. 3 Santiago of Corona (23-9) by the score of 9-8 on Wednesday behind goalkeeper Erin O’Donnell’s eight saves and a three-goal performance by Celeste Almendariz. The Mustangs trailed 6-4 at halftime the outscored Santiago 5-2 in the second half. 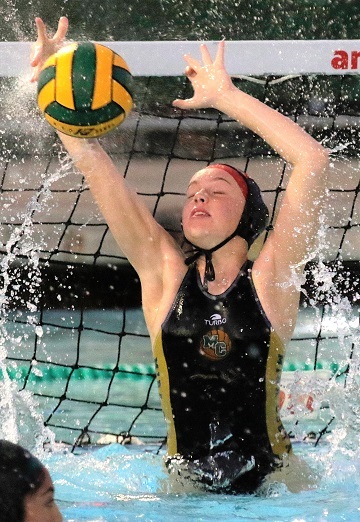 Mira Costa will take on top-seeded Oaks Christian (20-8) for the championship Saturday at 1:30 p.m. at the Woollett Aquatic Center in Irvine. Fourth seeded Redondo (21-6) fell to Oaks Christian 7-6 in the semifinals. Goalkeeper Katherine Wrightsman kept the Sea Hawks in the game recording 12 saves and Kennedy East scored twice in the loss. In the quarterfinals, Mira Costa goalkeeper O’Donnell recorded 16 saves to help the Mustangs secure a 13-6 victory over visiting Claremont. In the first half, Almendariz scored twice and goals by Leigh Lyter and Emma May gave Mira Costa a 4-1 lead at halftime. The Mustangs used the break to figure out the Wolfpack’s defense, recording five goals in the first four minutes of the half on two scores by Almendariz and one each by Elizabeth Terry, Camille Lyter and her sister Leigh. O’Donnell stopped six of seven shots in the fourth quarter while goals by Maiken Pardon, Leigh Lyter and May gave the Mustangs the win. Redondo also enjoyed a home victory with a 10-8 win against Segerstrom.Sabrina Dimesa recorded four goals and Brooklyn Behenna provided five assists for the Sea Hawks. Redondo has allowed only 13 goals in its two wins but went up against an Oaks Christian team that has scored 32 goals in its two games. In Division 6, second-seeded West Torrance (23-5) defeated host Los Amigos 14-12 in the quarterfinals then advanced to the championship game with an 8-3 victory over Arcadia on Wednesday. The Warriors will face the Buena Park for the title Saturday at 6:50 p.m. In Division 4, fourth-seeded El Segundo was upset by visiting Sunny Hills 8-7 in the quarterfinals after beating Burroughs and Downey.In Division 7, South Torrance fell to top-seeded Katella 5-1 and second-seeded Chadwick saw its season end with a 9-7 loss to Carpinteria. Mira Costa continued its quest for a CIF Southern Section Division 2 championship after defeating El Toro 3-1 and Bishop Amat 2-1 to reach the quarterfinals on Tuesday when the Mustangs edged Moorpark 3-2. Mira Costa (20-1-3) advances to host Vista Murrieta (15-3-3) victor Saturday at 3 p.m. The Mustangs reached the quarterfinals after defeating El Toro 3-1 then host Bishop Amat 2-1 on Friday behind the two-goal performance by Grace Watkins. Following a 2-0 win against visiting Quartz Hill, Redondo saw its season come to an on Friday. After playing to a scoreless tie, Newbury Park won on penalty kicks. Palos Verdes fell in the first round with a 3-2 loss at Pacifica. In Division 3, West Torrance (15-8-2) defeated Arcadia and Oxnard to reach the quarterfinals before falling to Culver City 1-0 on Tuesday. South Torrance (16-8) also advanced to the quarterfinals after upsetting second-seeded Riverside Poly then defeating Brea Olinda. 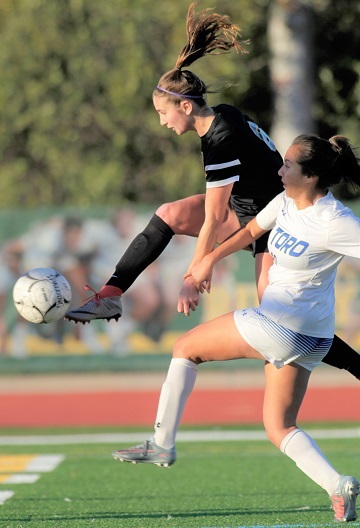 The Spartans saw their season come to an end with a 3-2 loss to visiting Flintridge Sacred Heart on Tuesday. Also in Division 3, Bishop Montgomery, who had eliminated North Torrance in the opening round, fell to Downey 1-0. Mira Costa’s boys soccer team saw its season come to an end but the Mustangs did not go down without a fight. Playing to a scoreless tie after the regulation and overtime periods, Mira Costa (19-1-3) was outscored by Long Beach Wilson 4-3 on penalty kicks. It was a heartbreaking loss for the Mustangs who entered the playoffs as the third seed. The team suffered only its second shutout of the season. Wilson (16-6-4) advanced to take on host Mater Dei (16-1-6) on Wednesday. Palos Verdes saw its season come to an end losing to Edison 3-0 in the second round. South Torrance fell to Paramount 2-0 in the first round. In Division 2, Redondo lost to Riverside Poly in the opening round. South Bay teams fared better in Division 3. El Segundo (21-1-1) defeated Brea Olinda 4-2 and Chaffey 6-3 on Wednesday. The Eagles will travel to Alta Loma for a semifinal contest at 5 p.m. on Saturday. West Torrance defeated Burroughs 1-0 before edging visiting Salesian 1-0 on Wednesday. The Warriors will play at La Habra on Saturday at 5 p.m.